Horseback riding boots are more than just the shoes you wear at the barn. Choosing the right boots is an essential part of making sure you have the equipment you need to ride properly. The best boots for horseback riding are functional boots that simultaneously protect your feet and enable you to cue your horse effectively in the saddle. 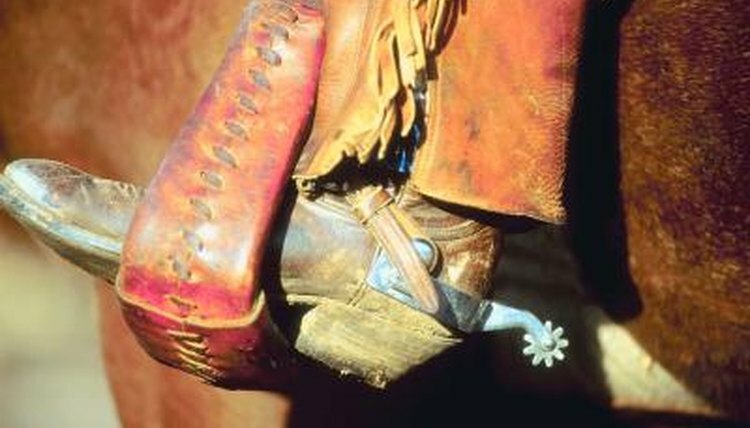 The entire concept of the cowboy or riding boot is a functional shoe for performing barn work and riding horses. Quality boots provide function with flair, creating very fashionable boots that also hold up well during work. Many aspects of boot choice depend on personal preference, but all good riding boots share some common design features. Since cowboy boots are fashionable, cheap imitation cowboy boots find their way to market. Boots designed solely for appearance do not function well for actual horseback riding. Poorly designed boots can make you uncomfortable at best and can be downright dangerous in the wrong situation, because they offer little protection for your feet and may offer little control or utility. A good quality horseback riding boot has a sturdy and functional basic design regardless of whether it is an English boot or a Western boot. You will need to select a boot correct for the riding discipline you participate. Good quality boots all feature the same general qualities regardless of riding discipline. A boot needs to be sturdy and made of thick, quality real leather which can hold up to the rigors of horseback riding. A riding boot can be made of soft leather but should not feel easy to bend or crumple when it is brand new and has not been broken in. The leather itself should be thick enough to protect your leg and foot from scuffs and scrapes during riding, and should support leg and foot when you are mounting and dismounting.The sole of the boot should be stitched onto the upper rather than glued on. The heel should be no more than 2 inches tall and no less than a half-inch taller than the sole. Safety is the most important aspect to consider when you're trying to determine which is the best horseback riding boot for you. A reinforced toe is protection in the event that your horse steps on your foot.The sole of the boot should be thick enough to protect the foot without being so thick that it is difficult to get in and out of the stirrup. If a boot doesn't fit in your stirrup, it is hazardous for riding and therefore useless. The heel delivers cues to the horse and prevents your foot from slipping all the way through the stirrup if your leg slips. Finding the right size boot is absolutely essential. A boot that is too small will pinch your foot uncomfortably and distract you when you are riding. A boot that is too big can confuse the cues you are giving your horse, not to mention it can slip off your foot. If you do not know whether a boot fits properly, have a knowledgeable boot store veteran check the fit for you. The leather upper needs to be snug around your foot, with just a bit of slip. Riders with slim calves can wear a boot with a tall shaft, while those who have large calves will need to select a boot with a shorter shaft, such as one that ends between the ankle and the bottom of the calf. What Are Galloping Boots Used For? What Are the Treatments for Equine Flat Feet? What Are the Benefits of Oxbow Stirrups? What Are Splint Boots on Horses Used For? Should Wedge Shoes Be Put on Horses? What Type of Saddle for a High-Withered Horse?